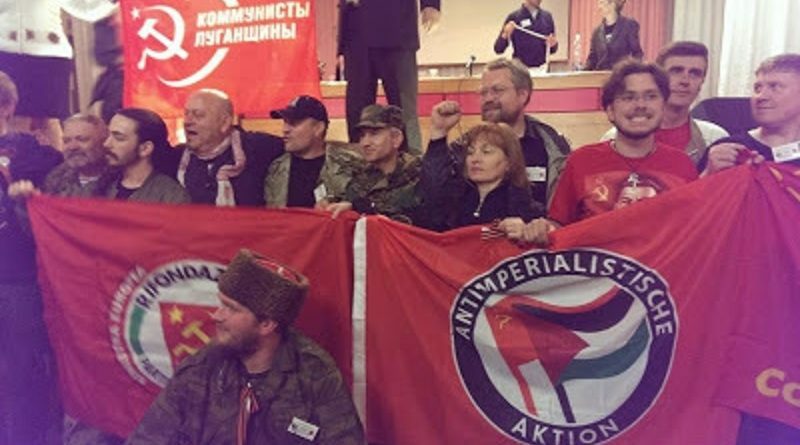 We, the International League of Peoples’ Struggle, with hundreds of member organizations in 43 countries and territories, salute the May 7 anti fascist conference taking place in the besieged city of Lugansk. We stand in solidarity with the people of Donbass in your resistance to the neo-Nazi regime in Kiev, which is a creature of US imperialism and its NATO allies. Your struggle is one with all those around the world who are resisting imperialism and fascism, from the Philippines to Palestine to Paris, from Korea to Kurdistan, in Africa and Asia and Latin America. We condemn the expansion of the imperialist NATO alliance into East Europe and the former Soviet Union. We condemn political repression in Ukraine and Moldova. May 9 marks the glorious anniversary of the defeat of Nazi Germany in a world war in which the greatest sacrifice was made by the people of the Soviet Union. It is a monstrous crime that 61 years after the end of that horrific war has again come to Ukraine, shells rain down again in cities and towns, schools, homes and hospitals. The men behind the guns are the direct political descendants of those Ukrainians who served Adolf Hitler. This time the US monopoly capitalist ruling class and its state are on their side, arming them and paying their bills. On May 2 two years ago, neo-Nazis burned gown the trade union hall in the city of Odessa, murdering at least 48 people. We salute the thousands who mobilized in Odessa this May 2 to honor the martyrs and not let this crime be buried. We hold the regime in Kiev and its backers in Washington responsible for this crime. The rise of fascism in the 1930s and the monstrous war that followed were products of the insoluble crisis of monopoly capitalism. It is capitalist crisis today that drives the increasing belligerence of US imperialism 25 years after the end of the “Cold War” and the danger of s new world war. Capitalist crisis is ultimately behind the wars and dislocation that has forced millions to flee their homes and become refugees. Today the forces of fascism are again on the march, from Ukraine to Greece to Central and West Europe. They incite hatred against migrants as a diversion from the failure of monopoly capitalism that is impoverishing workers of all nationalities. They must be stopped. These times call for a united front of all those around the world who are under attack by imperialism. We call on the progressive and democratic people everywhere to stand with the people of Donbass in their resistance to US-NATO imperialism and its fascist agents. We cannot allow the media to conceal the war being waged against the heroic people of Donbass. It must be made known to the people of the world. Glory to the memory of the heroes of the Great Patriotic War of 1941-1945! Honor and solidarity to the antifascist fighters of Donbass today!